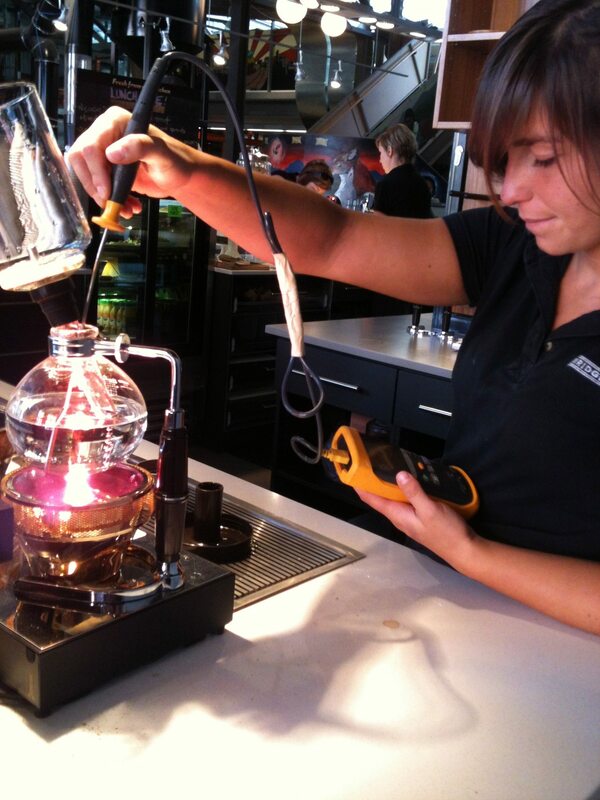 Bridgehead Barrista Meghan Goodchild demonstrates the siphon method for brewed coffee. The results are clean and clear coffee, packed full of flavour. I was confused. “You don’t have espresso and water?” I asked a bit sheepishly. “We don’t make those here,” he said. Ouch. Thankfully that has never happened to me here in Ottawa. But since that incident I have been particularly sensitive to the potential for coffee geeks to lose touch with us mere mortals looking for a tasty caffeinated drink. So I confess it was with a little trepidation that I walked into the new multi-million-dollar Bridgehead Roastery at Preston and Anderson to experience the so-called Brew Bar. I am delighted to report that it was quite the opposite of the snooty experience I had in Toronto. In fact, I was pretty blown away by the coffees I tasted and Barrista Meghan Goodchild was a wonderfully low-key guide for a newbie like me. 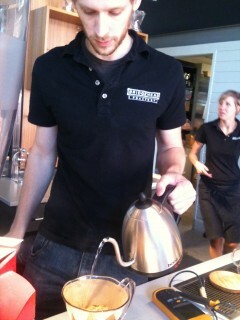 Coffee director Ian Clark preparing coffee with a Clever, his favourite brewing method. 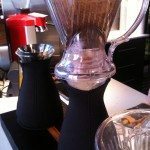 I am probably like many City Bites readers in that I love a smooth chocolatey espresso and, occasionally, a good creamy cappuccino or a latte — but I pretty much gave up drinking brewed coffee years ago in favour of espresso-based drinks. I grind my own beans at home and I use a Bodum or a basic Italian stove-top espresso maker — nothing fancy, no monogrammed tamper. But I confess my tolerance has dramatically declined for the vile brew that passes for coffee poured out of Bunn thermoses at coffee shops and restaurants and my standards for a regular cuppa joe became impossible to satisfy. At some point, I must have made the decision that brewed coffee is so rarely delicious that espresso became my drink of choice. So like re-discovering a long-lost faithful friend, Bridgehead is re-introducing many espresso drinkers like me to the pleasures of brewed coffee. Not only does Bridgehead now ensure ultra-fresh, top-quality beans, but they control the entire roasting process as well. 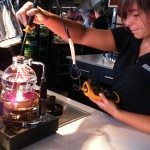 From there, customers can take their choice of four different methods for brewing coffee at the Brew Bar: Clever, Siphon, Eva Solo, and Chemex. This turns brewed coffee into something as personalized as an espresso drink. 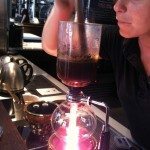 I was told that each method results in a cup of coffee with very different taste properties. The the only way to know which one you prefer is to give each one a try. 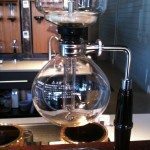 On my first visit, I tried the two most popular methods, the siphon and the Clever. I was impressed by the floral notes in the medium roast Guatemalan coffee prepared by siphon — and the clean, clear quality of the drink. 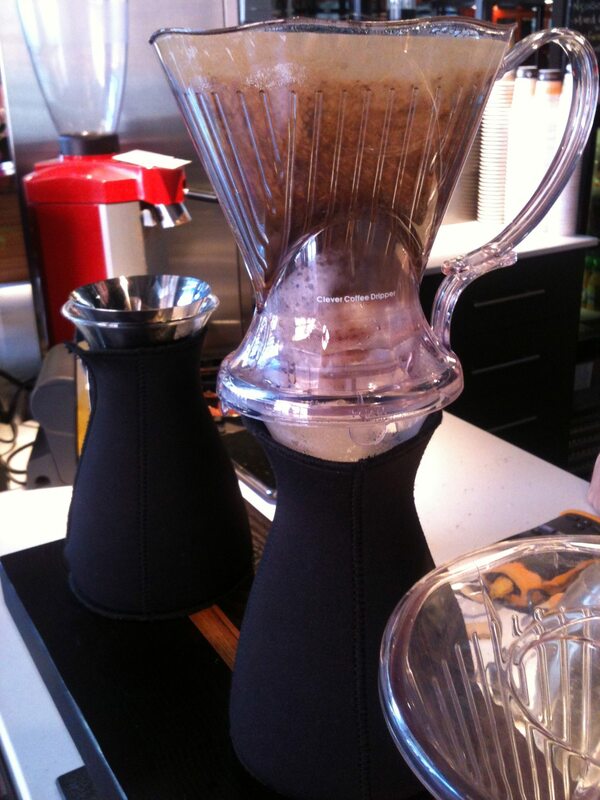 But then Ian Clark, Bridgehead’s coffee manager passed by during my tasting and suggested a try another cup made with the Clever — a simple $20 gadget that looks like the top of a old-school drip machine. 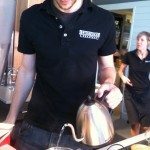 I was surprised to learn that this is his favourite brew method, and what he uses to assess new batches of beans each day. 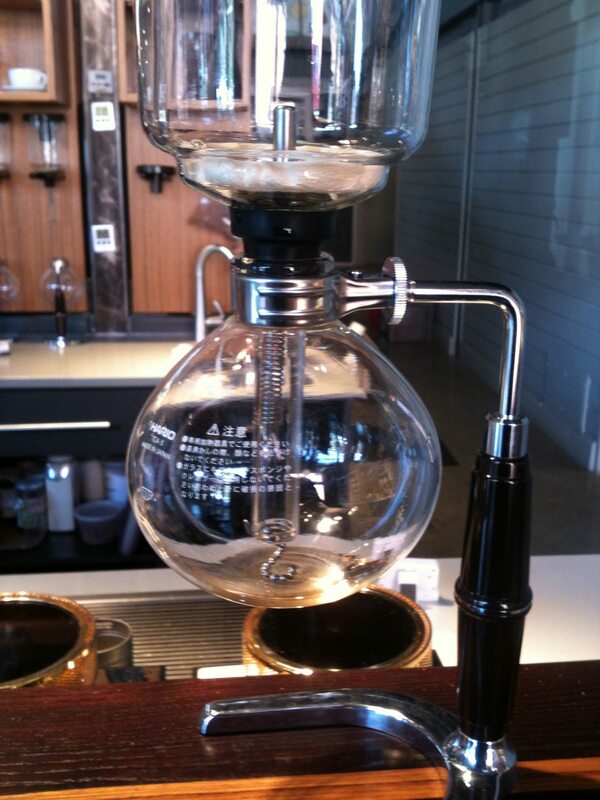 While the siphon is really cool to watch, he says, the Clever makes consistently the best coffee. Clark prepared a light roasted Ethiopian Yirgacheffe using the Clever to demonstrate the kind of “coffee experiences” that are possible thanks to the new Roastery. My first thought after taking a sip was that it tasted like tea and I struggled to pinpoint what exactly I tasted (no doubt, residual trauma from my Toronto experience). Clark put me at ease: “It juicy, citrusy with some acidity and sweetness, jaminess and florality.” I took another sip and I got it—peaches. The coffee tastes like sweet juicy peaches! Clark just nodded knowingly and smiled as if to say: my job here is done. 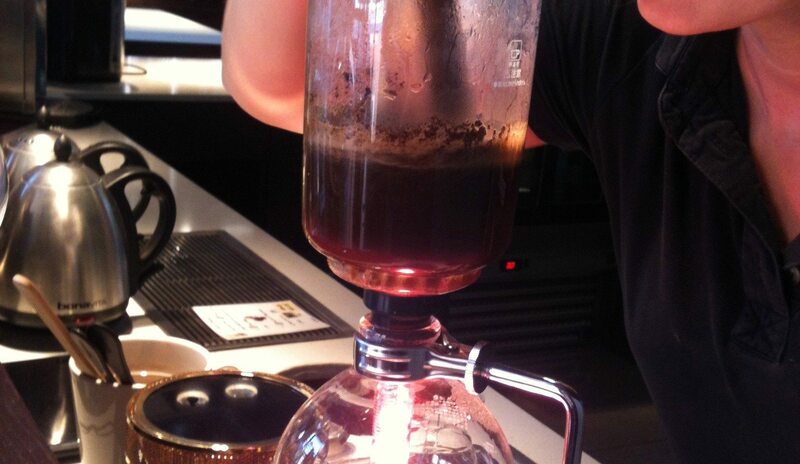 Coffee Manager Ian Clark preparing coffee with a Clever, his favourite brewing method. 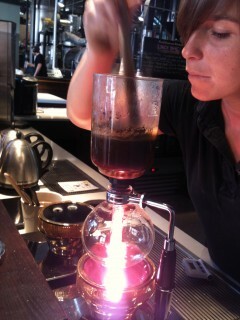 The Clever brewing method in action.